At upper left a winged angel stands on a cloud in a glory of light in which many winged cherubim fly about. 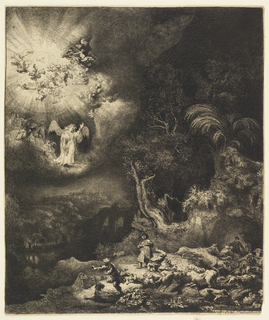 At lower right, the light is reflected, revealing a group of frightened shepherds and their flock. At left, a river and distant landscape elements are visible in shadows. At right, trees are dramatically illuminated.